The terminology related to climate change can bring a headache even to a specialist who is already familiar with climate and energy issues, let alone a person, who’s only just developed an interest in the theme. The Climate Secretariat of Russian Social Ecological Union continues with the series of articles under the heading “Complicated Things Explained Simply” and this time explains, what is the thing called INDC – a key part of the UN climate change negotiation process. 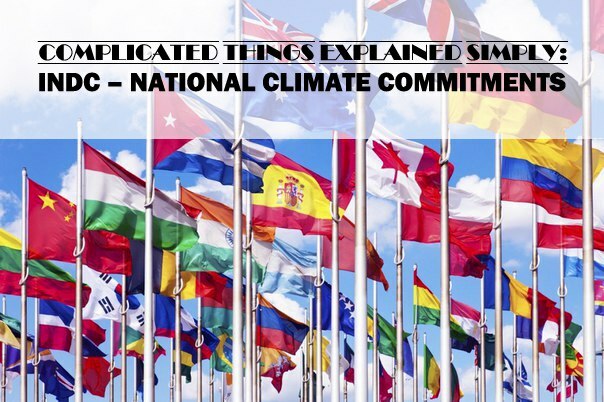 In the previous ”Complicated Things Explained Simply” article we dealt with the UN Climate Change Negotiations. This time we will concentrate on one of the mechanisms of the negotiation process: INDC – national climate commitments. The negotiations are far from easy: for the actively developing countries, whose economies have started to grow just during the last decades, decreasing emissions isn’t a straightforward matter – it might slow down their economic growth. But as for the vulnerable countries (for example island states that might be left underwater due to rising sea levels), climate actions and the support from the global society are a matter of life or death. INDC (intended nationally determined contributions) is a system for submitting national commitments in the global action against climate change. The system was developed to estimate and compare the resources and capabilities of different countries and it allows the countries of the world to declare, what they are PREPARED to do under the new agreement. Once all countries have submitted their contributions, it can be estimated whether the global society will manage to lower the greenhouse gas emissions to a level that would limit global temperature rise to 2оС. Russia submitted its INDC among the first ones – on March 21st, 2015. Russia declares, that: “Limiting anthropogenic greenhouse gases in Russia to 70-75% of 1990 levels by the year 2030 might be a long-term indicator, subject to the maximum possible account of absorbing capacity of forests”. It means that by using different methods (renewable energy, energy efficiency, new technology) Russia is committed to cut their greenhouse gas emissions by 25-30% from what they were in 1990 by the year 2030. However, the level of greenhouse gas emissions is already at the moment 30% lower than in 1990, which means, that the total emissions of Russia should not be permitted to rise. It can be estimated, that escape from the current economic crisis will lead to a 2-3 % rise in emissions, and if the scenario of intense growth without modernization comes true, we might witness even a 5 % increase. According to this scenario, Russia’s emissions in 2030 would be 25 % lower than in 1990. Should the emissions increase even more, they would have to zeroed out referring to carbon sinks in forests, even though the capacity of Russian forests to absorb carbon is not a clear-cut question. To reach the goals set in the INDC, Russia doesn’t really have to put in extra efforts besides follow the current policies. Russia did not give any extra commitments either, including adaptation measures. Alexey Kokorin, climate change specialist from WWF Russia, comments: “This INDC was prepared by sceptics of economic growth in Russia. Not climate change sceptics, but economic sceptics, because at the moment the “environment” doesn’t encourage the implementation of energy efficiency and other green decisions. Unless we change the terms of doing business in Russia and guarantee sustainable development in forest management, no one can claim, that there will be significant decreases in emissions. The phrase concerning forests in the INDC is just a precaution in case it turns out, that the emission reduction targets will not be reached. However, in reality, this backup clause doesn’t make a difference, since the amount the forests can absorb CO² will decrease by 3-4 times within the next 15 years. This development is connected to the inevitably outdated practices of the Russian Forest Fund that is responsible for Russian forestry and logging: Russia is “taking over” uncut forests in distant areas instead of managing the already logged forests more efficiently”. At the same time, China, for example, committed to the following objectives by the year 2030: reaching peak greenhouse gas emissions, reducing emissions by 35-40% compared to 2005, producing 20% of its total energy use with renewable resources, and increasing the capacity of forests to absorb carbon up to 4,5 cubic meters over the 2005 levels. All the European Union countries committed to reduce their emissions by 40% compared to the levels of 1990 by the year 2030. Olga Senova, head of the Climate Secretariat of RSEU, thinks that the potential measures of energy efficiency would allow Russia to set more ambitious emission reduction goals. The planned levels of energy efficiency and energy saving, written in the federal programme for energy saving, equal the amounts of energy sales from the biggest thermal stations. So far, the targets of the federal programme haven’t been reached and many reserves of emission reductions haven’t been put into effect in national or regional plans. Just by improving the energy efficiency in buildings when constructing new ones, modernizing the old ones or in general using the buildings energy-efficiently through-out their lifetime, it would be possible to reach emission decreases of over 100 mill. tons of CO² equivalents. In Paris, in December 2015, we will find out if the world society is going to be able to limit the global temperature rise below 2оС. In the meanwhile, we will keep a close look on the preparations for the important meeting. Found this interesting? Stay tuned for our articles “Complicated Things Explained Simply”!